As I noted in my review of Chick-fil-A, I am not really keeping up with the Bowie Restaurant Project, but if I happen to visit a restaurant in a way that enables a review, I'll add it to the list. 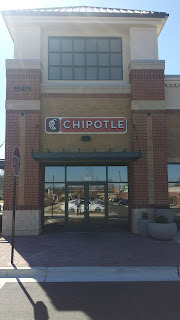 As I noted in my 2012 review of Chipotle's original Bowie location, I don't like Chipotle. On the other hand, one of the inspirations for the Bowie Restaurant Project was overhearing someone remark that since he was in Bowie, he was going to eat at Chipotle. That was fine if that was his favorite restaurant, but part of my goal has been to find better options for people. Anyway, I found myself in possession of a $10 Chipotle gift card, so fate was telling me to write this review. First, I used the web to create an order. The estimated total was $10.02. When I tried to plug in the gift card, it told me that I didn't have enough money to pay for my lunch, and offered me no way of kicking in the two cents in another way. So I changed my selection to "pay at restaurant", and the web site told me that it was now too late to get my food when I originally asked for it. In the ensuing chaos, I accidentally ordered it for over an hour in the future. The person at the restaurant was very nice about fixing my error when I called, and they were unnecessarily apologetic when the food wasn't ready when I arrived. I definitely give them high marks for customer service (though low marks for the web interface). As it turned out, the web site actually knocked the extra 2 cents off when I finally placed the order. That was nice, but it was dumb of it to complain about my gift card balance if it was going to do that. The food was fine. As noted before, one of the reasons I don't eat at Chipotle is the resulting digestive disruption I experience. Because of this, I can't rate it too highly. Hopefully soon we will have real Mexican food back in Bowie.